5x - 10x faster and less response variability. LTC) are instant and seamless. After reading this mammoth (and amazing) thread I’ve decided to give coinexx a go. My only concern is that it could share a similar fate to that of JAFX given that they don’t overtly prohibit U.S. clients, but rather explicitly stated (via email) that they accept U.S. clients. Are these fears unfounded? I wouldn’t be so cautious if their registration process were strictly anonymous, but they require a telephone number upon registration. I suppose a fake/temporary number coupled with a VPN would work if the number isn’t needed for any subsequent verifications. Is that the case? At least brokers like Evolve strictly state their disallowance of U.S. clients on their website, and even impose IP restrictions. Broker News – if you can call it news. Another big 50:1 broker in CFTC Nanny-Land? – What’s the point? The 50:1 pie in the US was essentially split between Gain and Oanda in 2018. In 2019, the same pie will be split among Gain, Oanda, and IG Markets. I know this has been discussed in the past but there are so many messages and people’s mind change over time. I was using Coinexx and they have worked pretty well, but during any times of news or high volume, the Metatrader console will freeze up and I won’t get my orders executed. This morning I had orders hang for 60 seconds or longer. SO I want to try another broker. I am in USA so limited options. I have it narrowed down to Finpro, Turnkey, and FX Choice. Can people please share their thoughts on them? Provide suggestions if you would suggest someone other than these 3? And also answer the question… are Finpro and Turnkey the same? Finpro’s server you connect to is called Turnkey Live. Does that mean Turnkey is the better out of the two of them since you go straight to the source instead of use Finpro who utilizes Turnkey’s servers? For what it’s worth, I’ve been using Coinexx for news trades and haven’t had any issues. When I was using MT5 there was about a 3 second lag (which is better than 60 seconds, but still a deal breaker for news events); but it was the same with FX Choice MT5 so I assume it’s something with that program. I’ve been using the Coinexx MT4 since they released it with instant execution on high impact news releases. I’m mainly using the full app on Windows 10, but I’ve also tried the iOS MT4 with no issues. All you need is a VPN. Comparable to opening and maintaining an account with Bitmex. The advantage to Evolve being (besides the obvious - fx and cfd instruments) you don’t need to route through said VPN while you trade. I didn’t see any email from them about this. Do you have a link or know why? Thanks. via BTC… I will leave the account unfunded. @MrInvisible the pairs with suffices are the ones they offer for trading & the pairs you are pointing to – the greyed out ones – are not for trading. they are just there for some testing they do in house. But this does create confusion and they should hide them or take them out. 89 new links have been added to post #2. 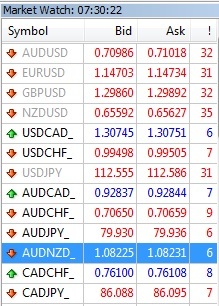 @MrInvisible the pairs with suffices are the ones they offer for trading & the pairs you are pointing to – the greyed out ones – are not for trading. they are just there for some testing they do in house. But this does create confusion and they should hide them or take them out. I have this thread pinned and read it often. It’s my understanding that the regulatory process of the Forex industry does not come under the executive branch. However, given the unpredictable nature of the present situation in the US, from a political standpoint, is there any chance of the regulations changing? The current Administration seems to embrace deregulation. Have the regulations within this segment of the finance / investing industry remained in place because they benefit big money / big business? so I have to accommodate these “suffix” characters on a per-brokerage basis. Let me go out on a limb here and say “Yes” ! deleted due to failing to quote Clint’s post.